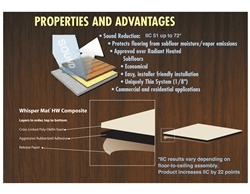 WhisperMat-HW is a peel-and-stick, non-permeable membrane designed to reduce impact noise for hardwood floors. Designed for use with all types of engineered wood plank, wood parquet and laminate floors, the WhisperMat soundproofing mat roll secures to your flooring for an airtight seal. The WhisperMat-HW sound reduction mat is constructed with a cross-linked polyolefin foam sheet combined with an aggressive rubberized adhesive that easily cuts into desired shapes and installs in minutes. Installing a WhisperMat underlayment under your hardwood floors is a fast, affordable way to improve the sound quality of any room while also providing protection from moisture & vapor emissions. The WhisperMat-HW is the best, most reliable sound reduction mat, and we have the knowledge to help you find everything you need for installation. Buy now to take advantage of our great prices and fast shipping, or contact us for more information. Follow wood flooring manufacturer's recommended installation instructions as to fully adhered or floating floor installation guidelines. Installation must also confrom to NWFA standards. Wood flooring and WhisperMat-HW must acclimate to job site conditions before installation. Concrete subfloors must be dry, clean and free of dirt, grease, wax, paint, oil or anything that would adversely affect adhesion of the WhisperMat-HW. Subfloor must be checked for excessive moisture. If subfloor moisture/vapor is beyond 4 lb. emissions WhisperMat-HW membrane cannot be used (see "Limitations"). Subfloors must b e flat to 3/16" in a 10' radius. Leveling cements must be completely dry before membrane application. Priming subfloor: Always apply the AFM 6000 primer to the subfloor and allow to dry approximately 20-30 minutes before installing the WhisperMat-HW to ensure a good bond. Unroll WhisperMat-HW with the release liner side down. Cut the length approximately 12" longer than the distance to be covered to allow for a trimmed fit. Fold back half of the length of the roll back over the other half of the material. Score through the release liner only, taking care not to cut completely through membrane. Pull release liner away from membrane to contact the primed subfloor. Keep the release liner material close to the floor while pulling away, this will allow for a more controlled application of the membrane. Uniquely Thin System approximately 1/8"